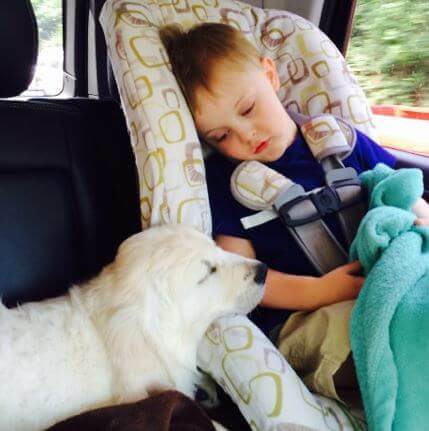 Why Choose a GoldWynns Puppy? Golden Retriever puppies. You can be sure that when you invest in a GoldWynns English Cream Golden Retriever, you are taking home the happiest, healthiest dog available! In order to raise high-quality dogs that excel in any course of life you may choose, we carefully select for pristine pedigrees. All of our male dogs and many of our females are European International Champions. Furthermore, all parents have detailed health screenings before they are ever bred. Importing retrievers with top bloodlines from Europe ensures the absolute best health and contributes to your dog’s success in the show ring. 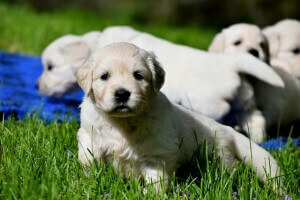 To show how confident we are in our English Golden Retriever puppies, each comes with a health guarantee. We provide a 1 year guarantee for any inherited health issues and a 5 year health guarantee if you continue to feed your puppy the diet and supplements we recommend. 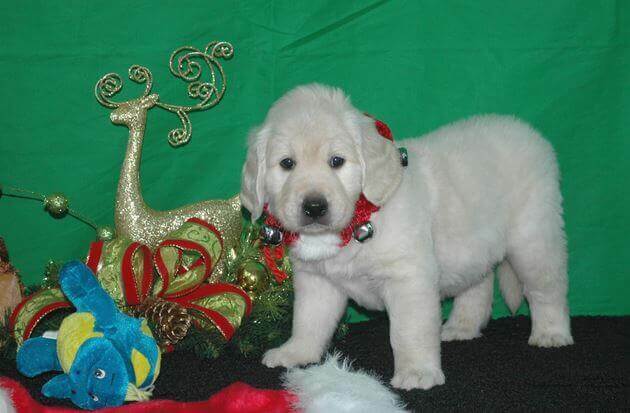 Our first priority is making sure you and your new English Golden Retriever puppy live long, happy lives together. In addition to superior health and pedigree, your English Cream puppy is raised with thorough care, attention, and love. We are sure to jumpstart socialization with other dogs and people so that your puppy is well-adjusted and friendly. Puppies we raise spend lots of time learning and growing in a state of the art puppy playroom full of toys with various textures, objects to climb on, tunnels to explore, and recordings of various noises to acclimate them to new sounds. We also provide extensive love and companionship for each litter, a necessity for this breed to develop excellent behavior and temperament. Our immersive puppy playroom, as well as the love and attention we shower each litter with ensures a friendly, loving, and approachable temperament. For more details on our socialization program and other factors that are carefully considered in raising your puppy, click here. GoldWynns puppies are born and raised in the country on 10 acres. 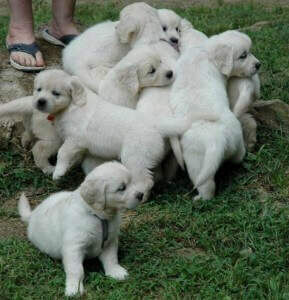 As they are brought up, our litters have access to an enormous, secure backyard to run and play in. This is extremely important to guarantee adequate exercise and also contributes to socialization. Puppies get play time several times a day between naps and feeding. Throughout life, your English Cream Golden Retriever will need plenty of exercise. By ensuring the puppies we raise have plenty of space to run, ample love and companionship, and stimulation throughout each day, we are upholding the core needs and characteristics of the breed. Learn more about details specific to the Golden Retriever here. 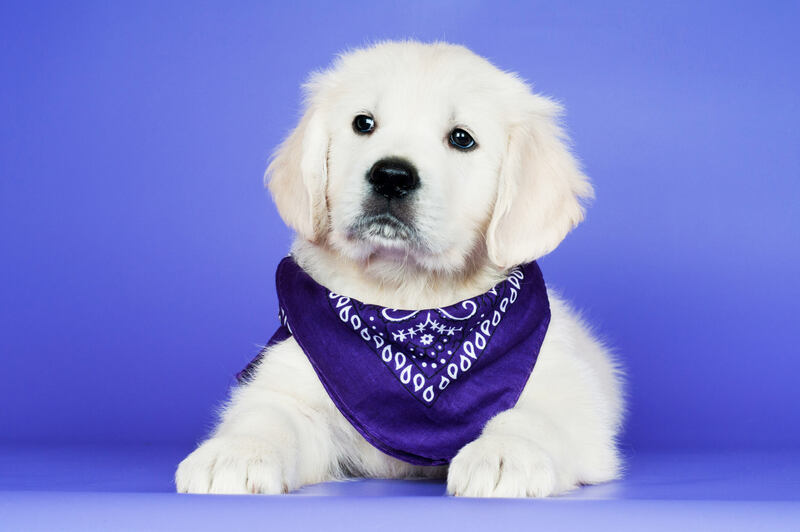 Over the years, we have carried out extensive research on dog foods available and honed our puppy diet to make certain we are providing our English Golden Retriever puppies the very best food for them. We feed each litter Life’s Abundance Large Breed Puppy food supplemented with Agility Formula, a joint and overall health supplement. This supplement helps build strong, healthy bones, joints, ligaments, and tendons, supporting overall health and well-being. This premium, wholesome dog food has no artificial colors or flavors, no corn or corn gluten, and no wheat or wheat gluten. The protein, calcium, and calories are carefully balanced to encourage healthy, controlled growth rates. By including multi-source, high-quality proteins, a propriety blend of minerals and vitamins, omega-3 fatty acids, antioxidants, and prebiotic fiber, this diet provides advanced nutrition for healthy development and paves the way for a long, happy life! 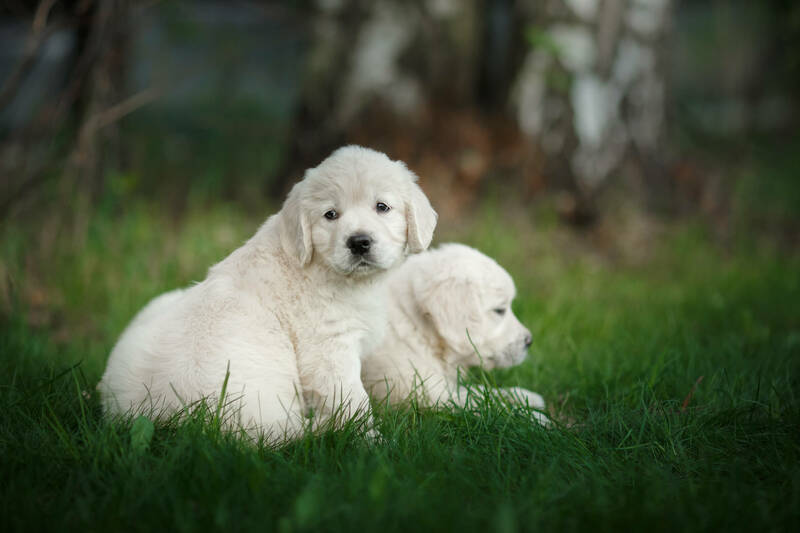 Before you bring your puppy home, there are multiple steps we take to guarantee the absolute healthiest English Cream Golden Retrievers equipped for whatever life has in store! We provide fantastic, trusted veterinary care, complete deworming and vaccination, and microchipping for lifelong safety. Additionally, we have a trainer come on site to evaluate the puppies and a final vet check before they are cleared to go to their new home. All of these steps are in place so that you can be sure you are receiving the best and healthiest puppies available who will live long, healthy lives. We even provide lifelong support after purchase, should you have any future questions or inquiries. We care deeply about all of our English Golden Retriever puppies we raise and want to help you and your puppy have the best and happiest life together! Above everything else, it is our love and devotion to our sweet English Golden Retrievers that sets us apart. Our lives revolve around our canine family and we want them to be surrounded by this love and affection throughout life. After all, they will undoubtedly bring love, laughter, and happiness to your home! We conduct background checks of prospective owners and have detailed applications. That being said, we would love to hear from you if you have any questions about our beloved breed, taking a puppy home, or support as your dog grows up! The manner in which dogs are raised truly dictates how they behave throughout life and fit into their new home. Our English Golden Retriever puppies are family for life and it is this love that transcends all else in ensuring they live long, happy lives with their new owners and families.